It’s about that time of the year again when the sun is shining the brightest and hottest and kids of all sizes and ages are taking out their swim gear, bikinis, board shorts and goggles. In a tropical country, this may be a funny thing to hear but believe it or not, it is not always summertime in the Philippines. Yes, there are basically two seasons- wet and hot, but around this time of the year (March-May) the sun shines the brightest, school is out, and the kids are raring to be out of the house. For my kids, the significance of summer vacation has not really hit home yet. They are preschoolers so school is a wonderland of books, crafts, stories, and songs. This is not yet that tough institution created to make knowledgeable and skilled individuals. This is still that enjoyable break from the possible monotony of home, a place to see friends and to talk to older, wiser, people who have so many fun ideas they want to implement. The challenge for me at this time of the year then, is coming up with creative ways to occupy the kids that are also informative and budget-friendly. The fact that they are not yet so into going out of town to the beach or nagging me to go take that six hour derive to the mountain province that is a popular destination during summertime is a great thing because this means I have the freedom to think up things that are not expensive. So, here are the things I’ve come up with so far. Remember way back when, when there were no Nintendo’s or PS3’s or X-boxes or Wii’s? Yes, there was a time before Atari decided to change it all for kids forever. During these times, the TV was just a box to watch a show on; Or a movie on Betamax or VHS. Back then, kids took their trusty bike’s or roller blades, or if they didn’t have either, a rock and a piece of chalk, and could pass the time in joyful, gleeful, outdoor play. My favorite outdoor games were hopscotch, Chinese garter, tag, and hide and seek. I really think there is a lot to be said about these games and about outdoor play in general. I really believe it strengthens the kids physically, gets them in touch with nature, and really builds more character. Plus, the great thing about this is that there are so many places to go that are free. You can take you pick of parks, football fields, picnic areas, or even the handy sidewalk right outside your house. I have so many memories of meeting friends for outdoor play and I really am thrilled that my kids can experience the same thing today. Of course, they still want their Wii but I can hold off for some time on that still. Add oil and food coloring to water. This play dough will keep for about 1 week if kept in a sealed plastic bag or container and slightly longer if stored in the refrigerator. Add the cream of tartar, water, and oil. Cook over medium heat until ingredients form a ball. This process almost automatically forms a ball of the dough on the stove and its not to hot to touch. (Does not take more than a minute on stove). Turn out and knead until smooth, about 1 minute, and let it cool. This play dough recipe will make play dough that will keep for at least two months if kept in a sealed plastic bag or container and longer if you store it in the refrigerator. 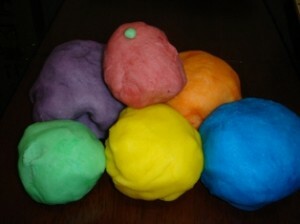 Play dough can be used for so many creative activities inside and outside the house. You can even think of this as combining point number one and this points. In a nutshell, the material here is supposed to be something used for learning and fun during summertime downtime. I am so impressed by the Junior Masterchef show from Australia. The youngest contestant was 8 years old! And these kids made real good dishes! Not your simple boiled egg. These were dishes with French names and showing a lot of technique. Now, my kids loved the show as well and now they want to be chefs as well. This is great. In my country, the kids used to be taught how to cook very young as they were tasked to help their moms prepare meals. This also came from the fact that families were so much bigger then. My grandmother had nine kids and so my mom learned how to cook when she was 7. I know my kids are a couple of years too young for serious cooking but helping out in preparing dishes and helping me when baking is something they can do, and have done, and really enjoy at that. If you already bake a lot then there is no additional expense. In fact, since you already cook anyway, the bonus here is that you have little helpers. Just be careful that you cook simple dishes when you involve them and always take care around the oven. This will surely keep them occupied for some hours during summertime. So far, these are the things I have come up with. I am sure there are heaps more ideas there for summertime activities that are learning experiences and budget friendly as well. What are your ideas for free summertime activities?